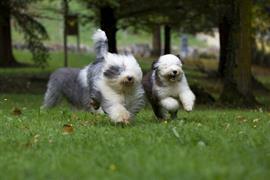 Names of English origin rank highly among Old English Sheepdog owners. A few Old English favorites for female puppies are Fern, Brea, and Hazel. Popular male names include Bradley, Carden, and Buster. Shaggy is the name of a character on Scooby Doo and also a common name among the Old English Sheepdog due to its very long fur coat. Other Scooby Doo characters that have been known to lend their names to dog owners include Daphne, Velma, and Scrappy. The breed's coat gets so long that it covers the face and eyes like a mask. Name ideas borrowed from masked superheroes include Arrow, Comet, Flash, and Zorro. Finding the right name can be as easy as visiting a fast-food chain. Some fast-food inspired favorites include Wendy, Zaxby, Cane, King. Some of our pages will contain a subcategory. A subcategory is a slightly more specific grouping than the main topic of the page. For a subcategory, we will include a separated table of names and corresponding descriptions. An example of a subcategory of Red Dog Names would be 'Dog Names Inspired by Red Wines'. If you have any subcategory ideas for the Old English Sheepdog Names page, we would love to hear them. Use the form below to submit your ideas.